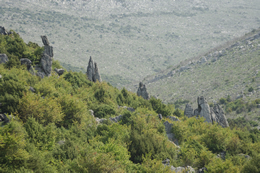 Tour type: Low mountainous climbing, medium partially lowering to Zogaj village. For Childs: Childs up to 14 years whith an adult. United whith agreenness diversity etc. The guide starts on foot or in bike starting from Paqe village (Buna bridge) riding gradually according to the roadway that passes near Taraboshi antenna going up in Bajraku peak 395m , and then continue through the road Taraboshi peak 594.2m and Golishti peak 651m and in the end going down in direction of Zogaj village with about 10m quote from the point that the guide continues near Shkodra lake through the roadway Zogaj-Shiroke-Buna bridge-Buna river Drini river conflux (Enigma Restorant)-Buna bridge-Shkodra castle. In Zogaj village is located a mosque also a little tradicional souvenir center and the fishing center.here is locatet the last stand of bus-line Zogaj-Shiroke-Shkoder. In Shiroke village is located a church, summer resort and different restorants wich cook Shkodra lake fish. In all the road Zogaj-Shiroke-Buna bridge-Buna river Drini river conflux there are a lot of different restorants wich cook Shkodra lake fish also Buna and Drini fish. The guide starts on 25meter quota on Paqe village (Buna bridge) and arrive on 651 m Golishi mountain and lower in 10m in Zogaj and later go up to 120m quota in Shkodra castle. Tour type Easy climbing,partialy difficult at the middle of Tour ,the movement is made according to the valley of Cemi river and Selca. For childs: Childs to 14 years with an adult. Marvelous varied mountainous view ,in background a passage of a fluvial view, field view to a hilly one. 1. The guide starts with car, bike or on foot from Paqe village (Buna bridge) and ends in Vermosh village.The road is paved from Shkodra to Rrapsh-Starja later the road is unasphalted but a good road till Tamara and later a little mountainous unasphalted road tll Vermosh. 2. .If our journey is by car until we reach upper Hoti our guide can be completed on foot or by bike according to the roadway till Tamara when we can find acomodation possibilityes or staying a few days in the villager houses or in tent camp.Leqet e Hotit offer us a mervelous place for the sport of mountainbike. Tamara offer us good possibilityes for summer rock climbing and possibilityes for kayaks,fishing in Cemi river.Later we continue on foot,or with various vehicles to the pictorial Selca village,Lepushes and Vermoshit.We have good possibilityes of acomodation or staying a few day in the villager houses or a camp in Lepushe when wew can climb the peaks round the village, like bjeshkeve te Namuna,Trojani peak etc. 3. From Lepusha on foot or by car continue to the most remote village in the north ,Vermoshi village wich offer us good possibilityes of acomodation in the villagers houses or a camp in the mervelous mountainous field. The guide starts from 25 m Paqe village(Buna bridge)and later gradual climbing to Leqet e Hotit 735 m ,we go down in the alpine center Tamare 262 m , later starts the gradual climbing in Selces holes 1126m, Bordoleci saddle,Lepushe 1356 m Lepushe village 1250m and go down in Vermosh village on 1068 m quota. The road last about 87km from wich 46.5 km is paved and the remaining part is unasphalted and Vermoshi village can be reched by all kinds of vehicles. Alpine equipment ,alpine shoes,warm clothes,climbing-irons,safety equipment. ,levizja behet sipas lugines se lumit te Cemit te Vuklit. Marvellous varied mountainous veiw,in background a passage of a fluvial view, field view to a hilly one. 1.The guide starts with car,motorbike or bike from Paqe village (Buna bridge) and ends in Nikç village.The road is paved from Shkodra till Rrapsh-Starja villages then is unasphalted but good till Tamara a little mountainous unasphalted through Vukel till Nikç. 2.If our trip is by car till upper Hoti the guide can be continued on foot or bike according to the roadway till Tamara where are offerd possibilityes of acomodation or finding acomodation a few days in the villagers houses or a tent camp.Leqet e Hotit display a paradise for the sport of cycling. Tamara offers good possibilityes for summer rock climbing and possibilityes for the sport of kayakas,fishing in Cemi river.Then continue on foot, or with vehicles to the pictorial villages of Vuklit and Nikçit.There are goot possibilityes of acomodation or finding acomodation a few days in the villagers houses or a tent camp where can climb the peaks around the village . The road last about 87km from which 46.5 km is paved and the remainig part is unasphalted, Vermoshi can be reached by all kind of vehicles. Alpine equipment, alpine shoes, warm clothes, climbing-irons, safety equipment. Marvelous varied mountainous view , in background a passage of a fluvial view, field view to a hilly one. Difficulty rating: easy,partialy difficult in the end of the tour. 1.The guide begins starting with car,motorbike o with bike from Paqe village(Buna bridge) and ends in Boga village.The road is paved from Shkodra till Ducaj village then is an unpaved road but good till Boga then a little mountainous unpaved road till Thore saddle. 2.If our trip is by car till Boge village(Okol) the guide can be continued on foot according to the roadway till Thethi or continue according to the footpath through Dhenve gap till Thethi where are offer these possibilityes of acomodation ,in the hotel or finding acomodation in the villagers houses or in a tent camp. Boga and Thethi present a marvelous place for the sport of climbing,mountainbike etc. Thethi offers good possibilityes for summer rock climbing also possibilityes for the sports of kayak,fishing in Shala river.Then continue on foot , or with other vehicles to the pictorial village in the Shala valley. 3.From Ducaj or Boga with foot or with car continue through the Peroit te Thate valley in a marvellous alpin view and then continue to Thethi or staying in Boga. The guide begins from 25 m quota Paqe village(Buna bridge)then gradual climbing to Koplik 54m,to Perroi i Thate 250m Upper Loha 400m, Then continue gradual climbing to Xhaj 598m, in Ducaj 800m,Boge 970m and ends in Thore saddle 1400m.The guide can continue according to the unpaved road till Thethi,finding acomodation in the villagers houses ,in hotels or in tent camps or we can come back to Boga finding acomodation in the villagers houses or in tent camps in Okol of Boga from where can be completed the itinerary for the climbing of the peaks around. The road last about 66km from which about 44 km is paved and the other part is unpaved and Thethi village can be reched by all kinds of vehicles. Alpine equipment ,alpine shoes,warm clothes. (1:25 000 Shiroka, Boriçi, Kopliku, Zagora, Reçi, Boga, Thethi. Thethi canyon 650m,Bregu i Lumit(Center)320m,Kiri 650m,Ura e Mesit 45m. 1.The guide begins starting with car from Paqe village (Buna bridge) and ends in Thethi village ,finding acomodation in the hoter or in the villagers houses or in a tent camp.In Thethi we stay a few days to climb the peaks aroun us.Then continue through the Shala valley to Breg Lumi and straight to Shkodra passing through Kir and in Ura e Mesit. Thethi displays a miracle for different sports like climbing,climb up, mountainbike, fishing, riding,kayak,etc. The road is paved from Shkodra till Ducaj village then the road is unpaved but good till Theth-Breg Lumi and then the road is a little mountainous and unpaved,also partialy difficult till Kir later a gradual improvement of the road and near Mesi bridge begin the paved road. 2.If the trip is by car till Boga village,is possible to stay here and to climb the peaks of the Boga village.The guide continue by foot according to the roadway or according to the footpath or through Shtegu i Dhenve till Thethi.Thethi offers some possibilityes of acomodation in the villagers houses or in the hotel or a tent camp from where can climb the peaks around also Bjeshkeve te Namuna peaks,positively can climb the highiest peak of the Albanian Alps Jezerca 2692m,Radohima.2568m,Paplluka.2569m,etc. Thethi offers good possibilityes for summer rock climbing and possibilityes for the sports of kayakas,fishing in Shala river. The guide begins in 25 m quota Paqe village (Buna bridge)then gradual climbing toThore saddle 1400m then go down in the alpine center in Theth 900m, and Thethi (Center).The road last about 135km from which 44 km is paved and the remaining part is unpaved,is possible to reach Thethi village with all kind of vehiclestill Bregu Lumit. The place have a lot of greenswards , forests, is located over a pictorial saddle , over a panoramic road and over a very inclined saddle. The jaunt isn’t possible without a home-brew guide. The jaunt last about 7 – 8 hour. 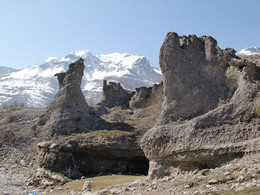 3,30 – 4 hour are calculated to come back to the itinerary from Theth Gjecaj till Buni i Thores saddle valley. Needs at last 3 hour for the walk from there, over Shtegu Dhenve till Theth Gjecaj. During the 6th hour of the trip, Shtegu i Dhenve is consider relatively difficult and is required to advance with slow and secure steps because of the precipitous incline that is very dangerous. Other grounds are partially fit with soft road through greensward and forests. Can walk for about 1 hour in a road through the nature without coming across to any vehicle. During the road there are no places to find foot , except two sources, exactly two drinking-fountain with potable water. In circa 90% of the length of the road, in both the two lower parts of Shtegu i Dhenve saddle present a high level difficulty because the climbing and the descent in this incline is very difficult, notably for the people that aren’t trained to climb mountains . In humid weather, the incline is very dangerous. Better is not to pass there in this conditions , till it turns in its normal state. The difficulty rating of the roads for walking depends from a easy one till very difficult, impassable and inclined. Lugina e vogël, direct under Buni i Thores saddle is a good place for a rest. In the beginning of October, fields and forests are covered by mushrooms with characteristic vegetation of the autumn season with a diversity of colors, canker-rose, trefoil etc. If the weather is good can see the region till over 2 000 m height. Very interesting is the historical automotive road Theth – Shkodër, which pass over Shtegu i Dhenve saddle. This saddle in different parts is so inclined that you will be surprised how animals climb this saddle. Before the road was build from the Italians before the Second World War, according to the information of the witnesses the road was build in winter, this very inclined gap was the direct connection with Shkodra. 1. Then we follow the stream for a while. 2. Then we devious from the stream in direction 120˚ going to a plain road, with a beautiful view over th valley. to a straight road and then a a rocky one.At the end we reach the forest. 5. Forest entrace:Climbing of the forest 225˚. 6. Small greensward: Change of the direction in 150˚. Have a lot of mushrooms. 7. Description of a road through a greensward, in 120˚. 8. During the entering in the forest,50 m above, in the right of the road is locaded a source with potable water. 13. Our trip is in a road in a forest 220˚:We reach again the roadway, but we left this road in 210˚ to enter in a wide road in the forest.This road cross again a footpath. 14. Some meters in the east is locaded a hill.From the hill can see Zorzi mountain ( 1663 m ). 15. View point.We walk in the roadway ,in which we cross a small number of vehicles, to the west to get close of the saddle .The panoramic view goes from Ndërlysës greensward till the saddle. 17. Before Buni i Thores saddle is locaded a small lake, with the name Liqeni:In the southern side of Buni i Thores mountain, is the road to this mountain. Then when we go down the road change to a forest road..
18. Then we follow a road through a valley . But the orientation with the compass help us to find Shtegu i Dhenve saddle, even if the visibility of the road was low . We we clim the saddle can see some remnant of an old gap. The allowance is difficult because the saddle is very inclined .From here can see clearly that the gap goes down. 22. In the southern side of the saddle, where the incline starts to decrease we walk forward. The road is full of pines and pass in a difficult rocky ground..
24. We are in a rocky ground . The location of the roadway is very clear.It, in some places can be seen from above. Climbing altitude: 1005 m Rest Camp, Razem. 1. The guide starts with car, bike or on foot from Paqe village (Buna bridge) and ends in the Rest Camp, Razem.The road is paved from Shkodra to Bzhete village ,then the road is unasphalted, a little mountainous but good till the Rest Camp, Razem. 2. If our journey is by car until we reach Bzhete village the guide can be continued on foot or by bike accordin the roadway till the Rest Camp , Razem.where iswe can find acomodation or tent camp. The guide starts from 25 m Paqe village(Buna bridge)and later gradual climbing to Koplik 50 m in Dedaj 500 m and ends a with a gradual climbing in the alpine center Razem 1005 m.
The trip last 50km from wich 44 km is paved road and the other part is unasphalted .Razem can be reached by all kinds of vehicles. Marvelous view, a diversity of a lave and fluvial view. 1.The guide starts with car from Tirana, Durresi Shkodra,Podgorica or Bar(Tivari) in direction of the ferry stand Koman. At 10.00 from Komani(Dike) start the two ferries, the passenger ferry and the passenger and car ferry to Fierze. Is a marvelous trip through the Drini river valley or as its called across Komani lake.The trip last 3 hours and pass through a marvelous fluvial,mountainous,carstik view etc. Then is possible to go with car ,bike or on foot B.Curri where we can find acomodation in hotel Turizmi.The road from Fierza(Ferry stand) to B.Curri continue parallel with Valbona river and in our left we can see a marvelous mountainous view. 2.If our trip is by car till Valbona(Gjese sources).the guide can be competed into the day. 2.If our journey is by car until we reach Valbona (Gjese sources).can be possiblet that the trip can be completed in one day. 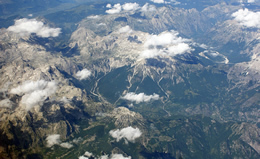 The trip last about 20km and is unasphalted road and you can reach Valbona village with all kinds of veichles.